What’s the one item in your kitchen you can’t possibly cook without? A spice, your grandma’s measuring cup, instant ramen — what’s your magic ingredient, and why? Photographers, artists, poets: show us KITCHEN. My first mother-in-law gave them to me 40-some years ago, when her son and I were first married. I didn’t care for them at first, deeming them cheap and ugly. I would’ve preferred the colorful, more expensive Pyrex bowls Grandma had. But who was I to be choosy? I had no mixing bowls. I didn’t have much of anything at that point. I was grateful for Marge’s gift, bearing in mind that she cooked for a living and she had raised and cooked for eight kids. She probably knew what to look for in a mixing bowl. Over the years I grew to appreciate the red mixing bowls more and more. I don’t even think they’re ugly anymore. They’re lightweight and durable, plus I like the pouring-spout shape and the easy-grip lip on the opposite side. 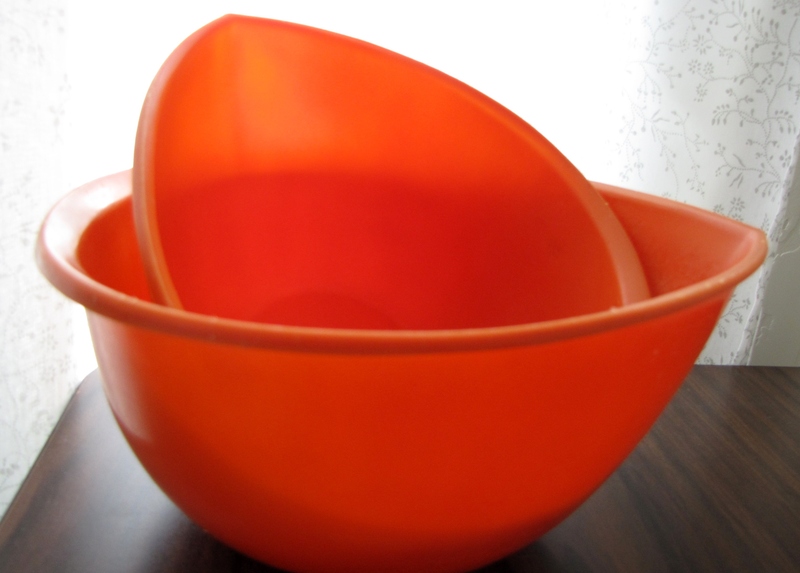 I eventually acquired Grandma’s Pyrex mixing bowls. I’m fond of them, because they were Grandma’s, and I do use them, but not nearly as often as I use the red ones. I think Marge would be pleased to know that I still appreciate her gift of mixing bowls. The marriage with her son didn’t last, but the bowls sure did. Categories: Daily Prompt | Tags: daily prompt, ingredients, kitchen, mixing bowls, pyrex | Permalink. For many years I have suffered from debilitating bloglessness, only writing in my head, while everyone else posted and shared with ease. Previous attempts at recovery have failed, my secret journals edited to death, pages torn out, crumpled and trashed. I will not succumb to this embarassing condition. I will continue to struggle against the rampant backspacing and endless blank staring. I refuse to relapse into the void that is bloglessness. I can do it. I am doing it. I am Overcoming Bloglessness. I do love ginger snaps! And gingerbread. Boy, that’s a good mixer! They don’t make ’em like that anymore! OK, I found you on Helen’s page and thought to myself – kindred spirit. 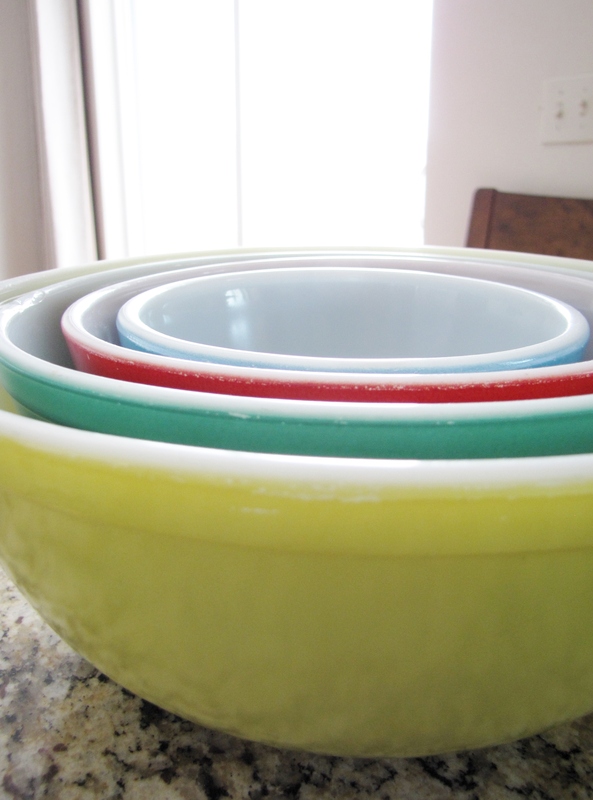 Then I wandered over here and saw the nested pyrex mixing bowls. I’m in! You see, I have my mom’s set that she acquired when she was a young bride in the early 1950’s. Just yesterday I was at a flea market looking at replacement sets – just in case. There have been one or two close calls over the decades! I look forward to reading more from you as your bloglessness recedes! I love connecting with my grandma’s kitchen through little things she has left me. A hotplate here, an ice cream scoop there. When I use those things as part of my daily life I still have a thread tying me to my time with her. Thank you for the nostalgia.